A true traveller knows that they can rarely go wrong with a Samsonite suitcase. Yes, they have way too many options you can choose from, but none of them will let you down. Today we are going to check out the Samsonite Chronolite, because it just might be their top suitcase. Now, I have talked about many Samsonite suitcases. Some of them I loved, like the Stryde Glider, and others didn’t really impress me, like the Neopulse. But I always honestly told you what I think, because it is my job to help you find the suitcase that you will not only fall in love with, but also use for decades. So, the Chronolite is one Samsonite suitcase that I have yet to tell you about. It is a hardshell, and it’s made of very sturdy and high quality material. If you want to find out more, you can read all about it in this detailed review of the Samsonite Chronolite suitcase! Does It Make Sense To Invest In The Stryde Glider? 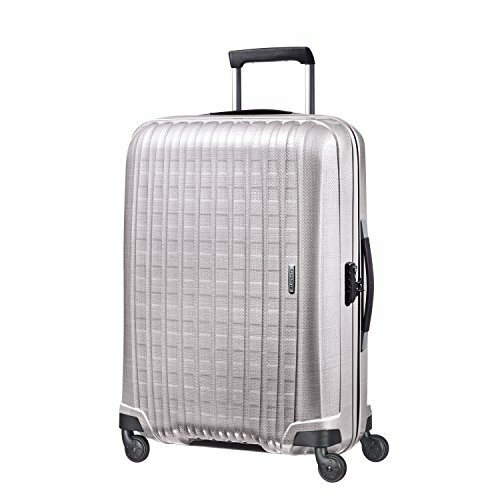 Before I give you all the juicy details about these Samsonites, let’s check out their basic specs first. The Chronolite suitcase is available in 3 sizes; the smallest one is a carry-on and the other two will have to be checked at the airport. So, whether you are shopping for a smaller or larger suitcase, you can find something for yourself in the Chronolite range. 21.7" x 15.7" x 7.9"
29.5" x 20.0" x 12.3"
The one thing that is missing that would make this suitcase “the bomb” is a little more color variety. The Chronolite is currently available in only two colors, Pearl and Chili Red. And I would have liked to see it in blue, black, or basically any darker color that would make those inevitable exterior scratches less visible. Yes, your suitcase will get scuffed and scratched eventually, just like any other hardshell will. But, don’t let that stop you from getting one! This Samsonite suitcase is made from revolutionary Curv material, just like we saw in their Lite Cube Spinner. 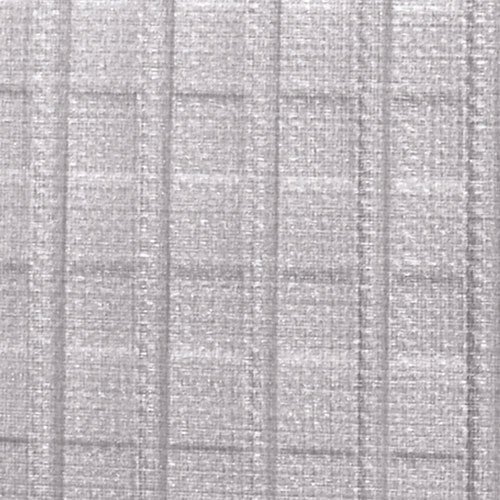 This material is actually made of layers of woven polypropylene that are formed into composite sheets and which make the suitcase extra durable. But, polypropylene is also an incredibly lightweight material, which is obvious from the weights of these suitcases. You have to hand it to Samsonite because 6.6 pounds for a 30” suitcase truly is impressive. Especially when you take into consideration that the corners of the suitcase are reinforced, for even better durability. All of you that frequently travel to and fro the United States probably already know how important it is to have TSA friendly lock on the suitcase. For those of you that don’t know, TSA friendly locks mean that TSA agents will be able to open up your suitcase safely, and then lock it up once they are done inspecting its contents. Random TSA checks are unavoidable, so getting a suitcase is a TSA friendly lock is the safest way to avoid any headaches caused by a ruined suitcase. The Chronolite has a 3-digit TSA approved combination lock that you can easily set up yourself. And one more feature that will help you sort of personalize your suitcase is the integrated ID tag. It is a useful addition, since you don’t have to waste money getting new tags every time you go on a trip. And it will also let everyone know that this awesome piece of luggage is yours. 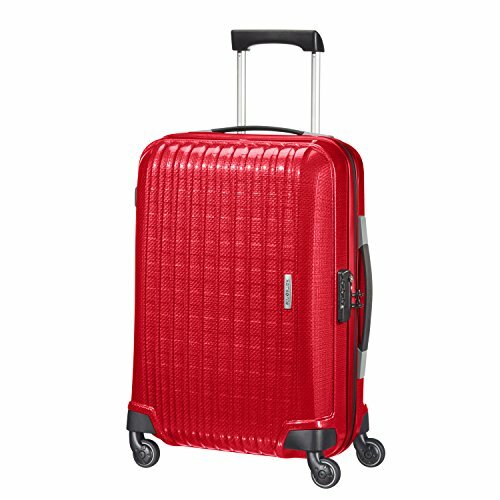 This Samsonite suitcase is equipped with single spinner wheels that will provide you with superb maneuverability of your suitcase. In case this is your first encounter with spinner wheels, I’m here to help. 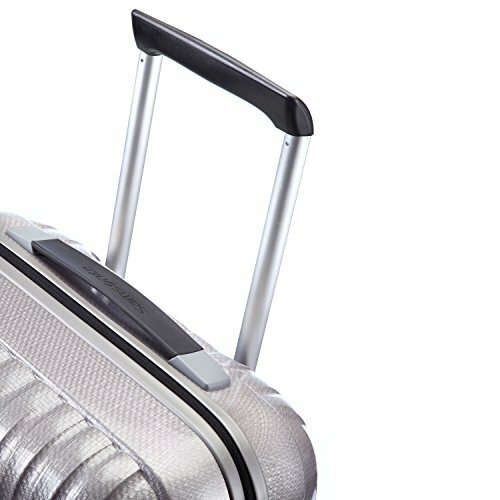 Spinner wheels are wheels that are able to turn 360 degrees each, which means that they can roll without a hitch regardless of the position of the suitcase. So, say goodbye to those days when you had to tilt your suitcase to get it rolling. That is, if you do decide to get the Chronolite suitcase. And also say goodbye to strained and painful arms that are a result of you dragging your suitcase behind you with a slightly bent back. In addition to that, you can also notice that these aren’t double spinner wheels, which we find more often in Samsonite suitcases. In fact, this is one more aspect where Samsonite decided to remove everything that is not absolutely necessary, to make as lightweight a suitcase as possible. 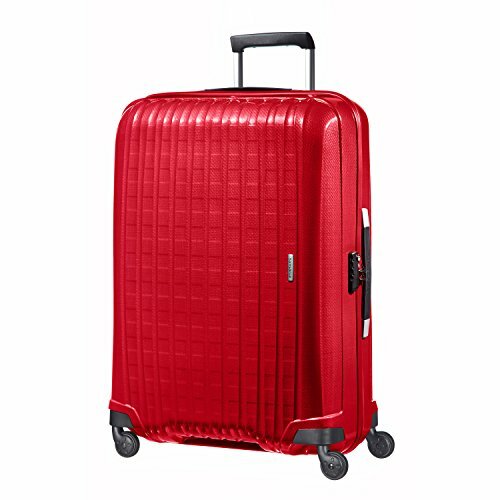 And you don’t have to worry about performance; both single and double spinner wheels both do a really good job at getting your suitcase from point A to point B. 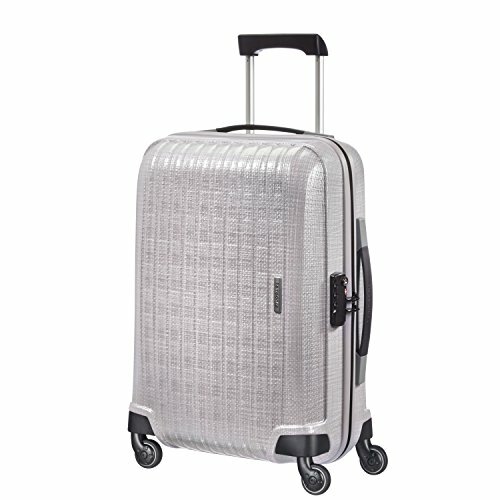 This Samsonite suitcase has a double retractable wheel handle. And the handle has a button that allows you to secure it into place once you’ve extended it. But, that should come as no surprise, as an extendable handle that can’t be secured into place is kind of pointless, right? 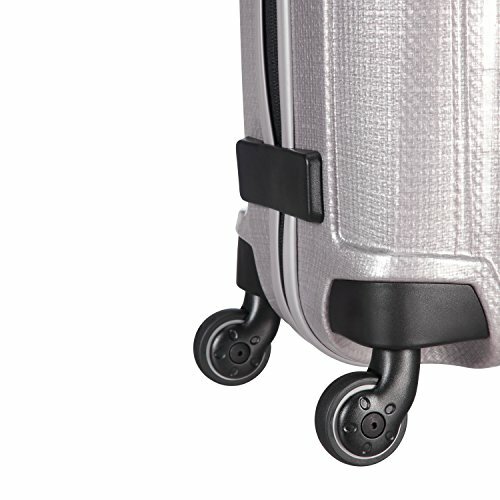 The wheel handle works wonderfully in combination with those spinner wheels, and allows you to have excellent control of your suitcase. Unfortunately, I wasn’t able to find out if the handle can be locked into multiple positions, so I can’t guarantee that all of you will be able to adjust to fit your height perfectly. As for the carry handles, they are very slim, which impacts the weight they add to the suitcase, but not at all their performance. In fact, they have a rubber finish, which means that they will feel very secure in your hands. And also that they will stay in place, and that you won’t be scared of dropping them. As you probably expected, the Chronolite opens up into two packing compartments. And both of them are very minimalistic and spacious, regardless of the size you choose. The compartments are lined (even though it doesn’t look like it) with soft fabric. And, I really like that the fabric is molded to the suitcase, as I prefer this look much to that of loos and ill-fitting fabric. 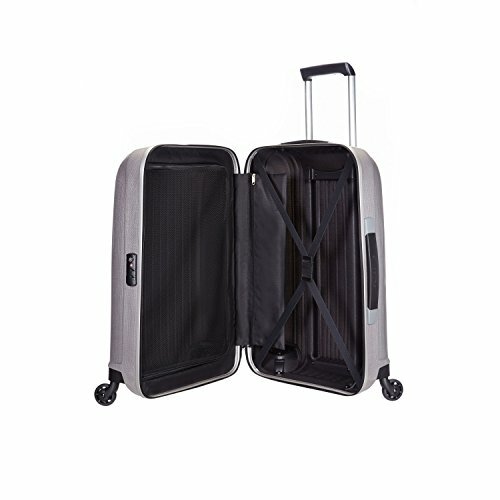 The top compartment of this suitcase features a zippered mesh divider. And the divider is see through, which not only means that it is lighter in weight, but also that you will still be able to see some of the stuff you packed in that compartment. Sadly, there are no added pockets in this part of the suitcase. On the other hand, there is a zippered pocket inside the bottom compartment of the suitcase. And as I said before, the fabric is molded around the handle protrusions, so you can have a better overview of what you can fit where. And once you put everything you need in this compartment, the elastic straps will ensure that it all stays in that exact place. Is The Samsonite Chronolite Worth Your Money? The Chronolite is an average looking suitcase, but it really has more to offer than the average suitcase. Because of that I would say yes, this Samsonite piece of luggage is definitely worth your money. For one thing, it is incredibly lightweight, which will save you some money on checked baggage fees. And it will allow you to carry more stuff with you, as you won’t have to worry about the weight of your luggage. The Chronolite is also very durable, and it features a minimalistic design, which I am sure many of you can appreciate. Some people don’t like to stand out with flashy luggage, and prefer to bland in. On the other hand, a lot of people actually love to be the center of attention in a crowd, and those people should definitely look into getting themselves a unique piece of luggage. But if the Chronolite is just what you are looking for, head over to Amazon. You can get a really good deal on the suitcase there, and with free shipping!